The total expense fee is 1.74% per year. This leveraged fund was incepted in February 2004. The fund sponsor is Tortoise Capital Advisors, L.L.C. This closed end fund has 33 holdings in its portfolio. Top 5 stocks are Magellan Midstream Partners L.P., Plains All American Pipeline LP, Sunoco Logistics Partners, Enterprise Products Partners, L.P., and Buckeye Partners, L.P. You can buy this fund for your investment account through your stock broker, and online brokerage. This TYG fund performance has been great since 2009. It has a great ranking by Morningstar. It also has a high yield for income seekers. 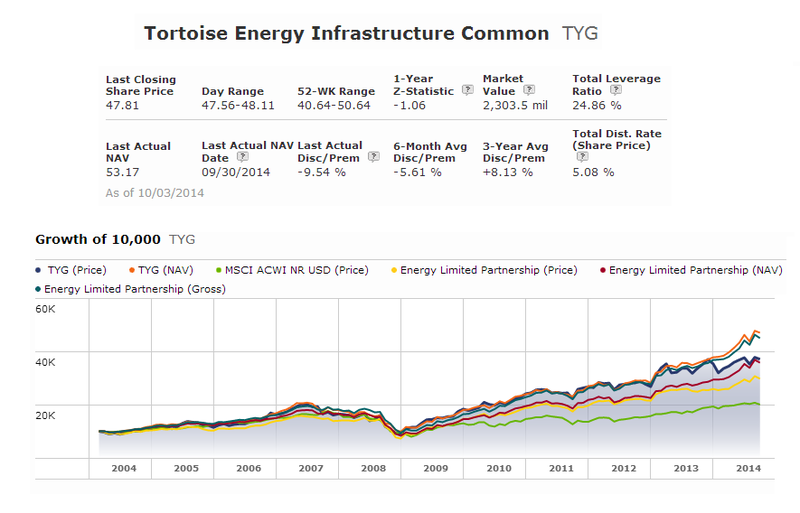 This Tortoise Energy Infrastructure Fund has a high expense fee.